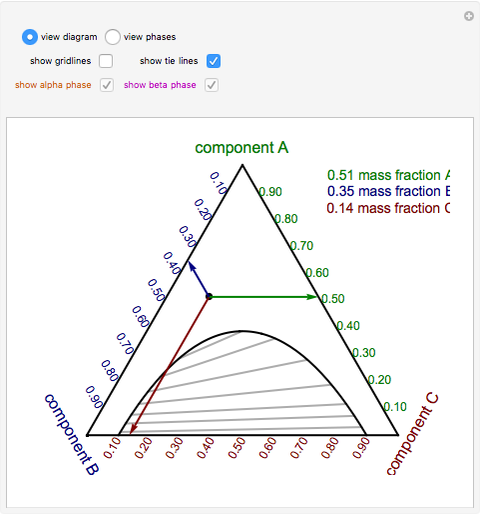 This Demonstration shows a ternary phase diagram with a phase envelope. This diagram represents the phase behavior for mixtures of three components that are only partially miscible over a range of compositions so that phase separation occurs. Move the black dot to any location within the triangle by clicking on that location, which represents the overall composition of the mixture. Each corner of the triangle corresponds to a pure component. The mass fraction of a component in the mixture is read off the axis that is the same color as that component. These axes are labeled by drawing a line through the point; this line is parallel to the base of the triangle that is opposite the corner corresponding to that pure component. 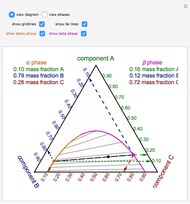 Click "phases" to view the one and two-phase regions (phase envelope). In the "diagram" view, check "tie lines" to view gray tie lines in the two-phase region. The endpoints of each tie line correspond to the compositions of the two phases in equilibrium ( and phases). Check "alpha phase" and "beta phase" to view these compositions. Points along the orange phase boundary are in the phase and points along the magenta boundary are in the phase. The point at which the phase switches to the phase on the phase envelope is the plait point; it is found by following the tie lines up until a tie line is tangent to the phase envelope boundary. 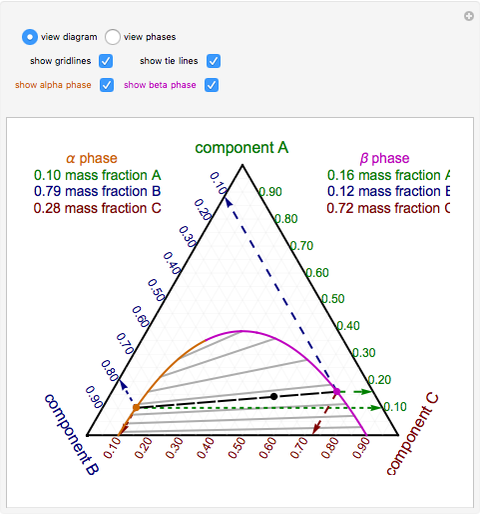 Ternary phase diagrams can also be drawn with mole fractions instead of mass fractions. 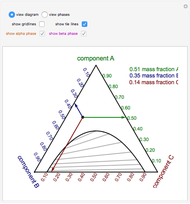 A screencast video at  shows how to use this Demonstration. 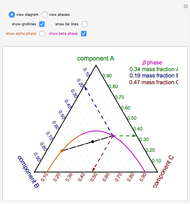 For more information on how to use a ternary phase diagram, view the screencasts at  and . Ternary Phase Diagram with Phase Envelope. www.colorado.edu/learncheme/thermodynamics/TernaryPhaseEnvelope.html. 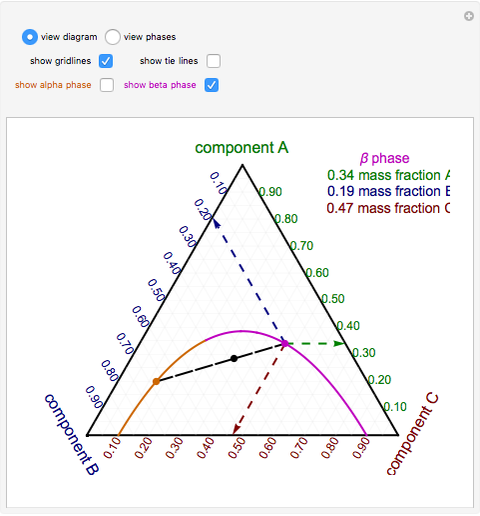 Using a Triangular (Ternary) Phase Diagram [Video]. www.youtube.com/watch?v=gGYHXhcKM5s. Interpolating Tie Lines on aTernary Diagram [Video]. www.youtube.com/watch?v=n7DPiuHllZE. Rachael L. Baumann "Ternary Phase Diagram with Phase Envelope"